A calibrator or process calibrator is used for basic measuring, testing and regulation techniques for setting and verifying test installations and instrumentation. PCE Instruments' calibrator products are lightweight yet made of durable materials. Our calibrator devices are easy to use and primarily handheld, though fixed installations are possible. A calibrator is valued by technicians due to its high level of accuracy and its universal range of applications. 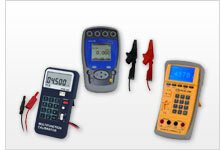 No electrician or electrical technician should go without a process calibrator. The process calibrator is also instrumental within the industrial sector, especially within large facilities where many parameters of electrical measurement must be analyzed. The calibrator has different magnitudes that should be attributed to normal measurement signals. These measurement signals or regulated magnitudes are denominated as the test signal that the calibrator can provide. They are defined as 0 to 20 mA, 4 to 20 mA, 0 to 10 V and 0.2 to 1 bar. These magnitudes signify, for example, temperature, output or settings of a test valve (0 to 100% of valve opening). This means that for a regulating signal of 50% (e.g., 10 mA) with an input range of 0 to 20 mA in a test valve, the valve opening will be 50%. Some calibrators are task specific. For instance, a calibrator can be tailored for use with infrared thermometers in laboratories. The calibrator’s thermal block, also called a black body, serves as the source of radiation for calibrating pyrometers. This kind of calibrator also allows for use of the thermal block in adverse conditions. The calibrator control unit is simple to utilize and has an easy-to-read display that shows the temperature being verified. A specialized cooling unit on the calibrator allows for temperatures to be raised or lowered quickly. PCE-123 is a multifunction calibrator used to test and calibrate a variety of measuring instruments. Offering a high level of accuracy for an affordable price, this easy-to-use calibrator provides electrical (mA, mV, V and frequency in Hz) and temperature (in °C or °F) output signals, making the calibrator useful in a wide range of applications. The calibrator PCE-LOC 20 can be used to directly simulate process currents in current loop, mV and mA. This allows the calibrator to be used to set process displays, data loggers, paperless recorders, etc. The calibrator PCE-LOC 20 can be purchased here in our online shop. The RTD calibrator PCE-RTD 20 is used to simulate resistors and resistance temperature sensors. Thus, the RTD calibrator is able to be used as a calibrator for temperature measuring devices. You can buy the RTD calibrator PCE-RTD 20 here in our online shop. The thermocouple calibrator PCE-TTC 30 can be used to simulate different thermocouples as well as mV. Thus, the thermocouple calibrator can be used for many thermometers and temperature displays with thermocouple connection. You can buy the thermocouple calibrator PCE-TTC 30 here in our online shop. PCE-123 is a multifunction calibrator used to test and calibrate a variety of measuring instruments. Offering a high level of accuracy for an affordable price, this easy-to-use multifunction calibrator provides electrical (mA, mV, V and frequency in Hz) and temperature (in °C or °F) output signals, making the multifunction calibrator useful in a wide range of applications. PCE-SC 10 is a class 1 acoustic or sound calibrator used to calibrate microphones, sound pressure level (SPL) meters and other noise measuring devices. Suitable for use with type 1 or class I noise measuring instruments, this portable decibel (db) meter calibrator is easy to use in the field or the laboratory. Multifunction Calibrator that measures and simulates current and voltage signals and thermocouples / integrates a function generator for specific waveforms / large graphical display with backlight /data logger function. The calibrator PCE-MCA 50 is intended for calibration and maintenance. This calibrator PCE-MCA 50 enables the measurement and simulation of electrical quantities. Due to the battery operation, the calibrator PCE-MCA 50 can be used in different locations. PCE-VC20 is a portable shaker vibration calibrator used to calibrate vibration sensors, meters, analyzers and testers. Suitable for calibrating equipment weighing up to 600 g (1.32 lb), this rechargeable-battery-powered vibration calibrator generates mechanical vibrations with a quartz-stabilized vibration frequency of 159.15 Hz (radian frequency 1000/s). PCE-VC21 is a portable shaker vibration calibrator used to calibrate vibration sensors, meters, analyzers and testers. Suitable for calibrating equipment weighing up to 600 g (1.32 lb), this rechargeable-battery-powered vibration calibrator generates mechanical vibrations with adjustable quartz-stabilized vibration frequencies between 15.92 and 1280 Hz and adjustable vibration amplitudes between 1 m/s² and 20 m/s².